We pride ourselves in staying current with all of the latest guidelines, requirements and standards for designing and manufacturing children’s toys. All of our products are tested using certified independent laboratories to ensure that we meet or exceed all Consumer Product Safety Commission (CPSC) guidelines as well as ASTM Standard Consumer Toy Safety Specifications. M-Y Products LLC, manufacturer and distributor of Rockboard Scooter, is committed to safety and quality with all of our products. We designed a revolutionary new scooter with safety in mind, turns out that kids love to ride them too!" My family absolutely loves to play outdoors. My son is very active, and loves to be on the go and try new things. So when I was offered the chance to review a Rockboard Scooter, I couldn't wait to try it out! When the Rockboard Scooter arrived, my husband got it set up and we were ready to head outside. Of course, Cooper had to be the first to give it a try. Though he is a little small for it, he had a blast and really learned to maneuver it easily. I was next to give it a try, and I loved it! It is soo much fun! The Rockboard Scooter is actually two scooters in one. The advanced Rockboard technology allows you to shred the pavement in rockboarding mode or quickly transform it into a low-profile kick scooter. The rear spring-enhanced suspension means the smoothest ride even on the most unforgiving pavement. With superior strength and lightning quick dual-mode action adjustment, your new scooter means hours of insane fun. It features reinforced handlebar assembly for safety and an oversized nylon coupler that allows handlebars to be folded for compact storage. The telescope downpipe with height adjustment lock on the scooter lets you adjust the handles to your exact height, and the comfort grip and aluminum alloy brake handle allow for hours of Rockboarding with perfect control on the pavement. The two-position locking joint for dual-mode scooter capability and easy folding lets you take it anywhere, and racing-inspired bearings keep your scooter rolling. We play with the Rockboard Scooter almost every day, and it is a still a favorite! I love the fact that it has a brake handle, which helps to prevent accidents from occurring. I also love that it folds up neatly for easy storage! I would definitely give the Rockboard Scooter 5 stars! My family has had tons of fun with it, and we have only had it a short while. I would recommend the Rockboard Scooter to anyone! Kids love it, but so do adults! BUY IT! You can purchase your own Rockboard Scooter at http://www.target.com/ for just $199.99 (with free shipping offered om their website)! WIN IT! 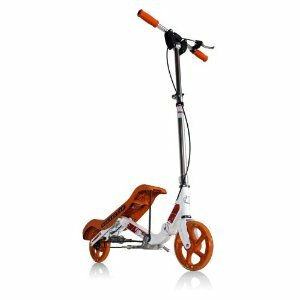 One very lucky reader will win their own Rockboard Scooter, valued at $199.99! Visit Rockboard, then come back and tell me which color is your favorite, or something that you learned about the Rockboard Scooter! Tweet about this giveaway! (Leave your Twitter name and a link) You can tweet this daily: “Rockboard Scooter giveaway (ARV: $199.99) at Opinions of a Moody Mama #win @coopersmommy @RBscooter http://tinyurl.com/3tr7yrv "
I like the blue rockboard scooter. My favorite is the blue. I like the fact that Rockboards products are tested using certified independent laboratories to ensure that they meet or exceed all Consumer Product Safety Commission (CPSC) guidelines as well as ASTM Standard Consumer Toy Safety Specifications. I love the blue one! I also like that you can ride it and not have to put your foot down at all. That's awesome! I liked Opinions of a Moody Mama on Facebook! I like your page on FB - Marianna B.
I like this post on FB with my username Mary Happymommy. The blue scooter is my favorite. That's cool that the scooter can go up to 10 mph. Nice that the scooter folds up. Lime Green is my favorite color. Well, my daughter is begging for the pink and my son the orange. However, for me, it really wouldn't matter, I would just love to see this in action! My son would love the orange one...Thanks for the contest!! My favorite color is pink, of course!! I love the blue one, soo cool! My daughter would love the blue one. thank you! I prefer the color orange for the Rockboard scooter. I am a fan of Rockboard Scooters on Facebook. I am following Rockboard Scooters on Twitter. I voted for you at picket fence blogs on 8/19. I like the orange scooter. The blue one would be perfect for my 8 year old son! I like Rockboard scooter on facebook! My favorite is the blue scooter. I "liked" the post. My FB ID is Carole Spring. I voted for you at Picket Fence Blogs! I like Rockboard Scooters on Facebook! I follow Rockboard Scooter on twitter! My son would love the orange one! Cool! I voted for you at picket fence blogs 8/20. I entered your Crazyforbargains.com giveaway. I entered your Flojos Sandals giveaway.